Ni Hao friend and Welcome aboard!! Over the years, they have undergone a few different iterations. Let’s look at a timeline! The original model came in the form of the K240 Sextett, which was originally made in Austria. In fact, all 3 of the models preceding the K240S were made in Austria. Unfortunately, both the S version and MK II are made in China. According to my research, some claim that this has had a negative effect on build quality. I did own the K240S at one point, and while the sound was phenomenal, it did seem a little on the flimsy side. It didn’t break on me however, but I could see it possibly failing at some point. The headphone is extremely lightweight, but doesn’t feel all that sturdy in your hand. 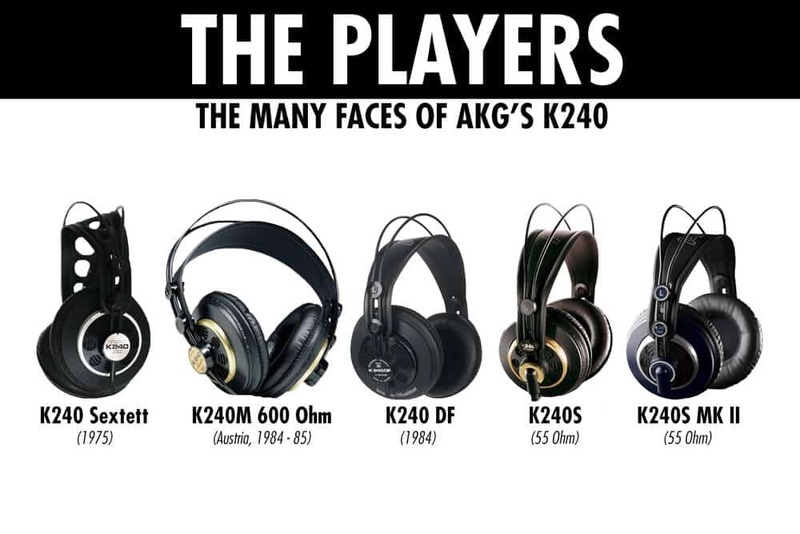 Learn more: AKG K240 Review! If you’re interested in learning more about the Sextett, and the differences between the K240 and MKII: AKG K240 vs. K240 MKII! So how does this all compare with the original K701? Let’s find out! Amp. Both the K701 and K240 are going to need amplification of some sort. The old K240M at 600 Ohms was notoriously difficult to drive. the K240S isn’t quite as stubborn. I was able to plug mine into a Focusrite Scarlett 2i2 and it sounded good. Nowadays I use a Schiit Magni/Modi stack, and that should suffice just fine. The K701 is a bit of a different animal, in that it needs something a little more powerful according to a lot of people. How to choose a Headphone Amp! The Vioelectric V200 is a fantastic option, but you could just go with the Schiit Magni and call it a day. Due to their higher sensitivity and somewhat in between impedance (62 Ohms), you should be fine investing in a more affordable amp pairing. Learn more: Magni 2 vs. Magni 2 Uber. Origin. Both were originally made in Austria before outsourcing to China. The original K701 had 7 bumps on the headband, then 8, and then no bumps after being made in China. Bass. Both have a very lean, light bass response, but the K240’s will roll off more considerably than the K701. Keep in mind this is a slight difference, and only really seen from a graph comparison of both headphones. Material. Both are primarily plastic, but the K701’s feel sturdier in your hand, and the ear-cups are made of velour. The K240’s cups are a cheap feeling faux leather, and they actually feel less substantial than a typical headphone with fake leather. Both have circular shaped ear-cups. Cable. The K240S has a removable mini XLR cable. What is XLR? The original K701 did not have a removable cable. Terminator. The K240’s terminate in your standard 3.5mm jack and come withe a 1/4″ adapter. The K701’s terminate in a 1/4″ jack with a 3.5mm adapter. Depth, Detail & Imaging. The ear-cup depth on the K701 is much deeper than that of the K240. This coupled with their completely open nature does contribute to the 701’s more detailed, airy, and spacious sound as well as it’s wider Soundstage. What is Soundstage? Soundstage. Continuing in that same vein, the Soundstage on the K701 has a somewhat unnaturally large Soundstage with a hollow center image. The K240’s Soundstage is pretty open and airy, but isn’t nearly as wide. Mid-range. There’s a similar bump in both at around 2-3k, but the K701’s is somewhat more aggressive, resulting in some extra energy with regard to instruments (guitars), and vocals. The K240S has a smaller bump by contrast, but you’re still going to get that same energy. There’s just not quite as much of it. Treble. The treble on the K240S has a peak around 8 and 10K, while the K701’s have a few smaller peaks in the same general area. From Tyll’s graph, it looks like the treble rolls off considerably after 10k. This simply results in a somewhat brighter sound coming from the 240. The K701 is still relevant and good, but both the K702 and Q701 improved upon the unnaturally large Soundstage, as well as the bass. It’s hard to choose which is better between the two. In most of my articles I recommend the Q701, and some the K702. In reality, the differences between the 3 are very minuscule, and even though we can sit here and dissect it all day, you may not even be able to notice! Put it this way: Whichever one you choose will be a good decision, but I would have it come down to either the K702 or Q701. SEE THE K702 FOR YOURSELF!! SEE THE Q701 FOR YOURSELF!! The K240S is a nice entry level option, but build kind of holds it back. Try the Sennheiser HD558 instead. It’s more comfortable, durable, and has a more balanced overall sound. I consider it just about the best entry level open back you can buy. Interested in learning why? Finally, if you need the absolute Gold Standard in reference, and want the quintessential studio headphone, try the HD600. It’s been around since 1997 and only gets more relevant as time goes on. Why? Because it represents the benchmark standard in studio headphones, to which all others should be compared. Don’t believe me? LEARN MORE IN MY OFFICIAL SENNHEISER HD 600 REVIEW!! Well that’s about it for today my friend! I hope you’ve enjoyed this AKG K701 vs. K240 comparison. Which of these tickles your pickle? What do you think about the HD600? I would love to hear from you. Until next time..
Sony MDR 7506 vs Audio Technica ATH M50 | WHO’S BETTER! ?